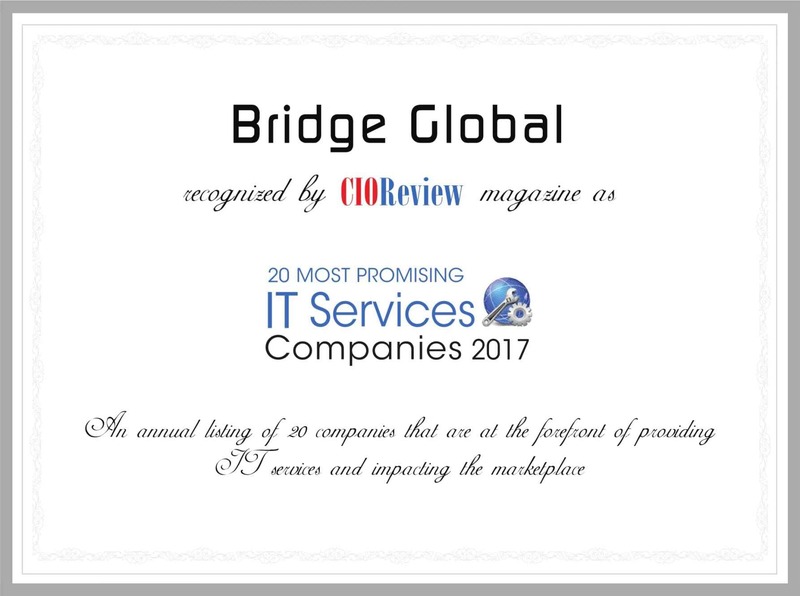 Press Release (ePRNews.com) - EAST BRUNSWICK, N.J. - Mar 15, 2017 - The CIOReview magazine has recognized Bridge Global as one among the 20 most promising companies in the IT services companies for the year 2017 (http://it-services.cioreview.com/vendor/2017/bridge_global). CIOReview being one of the leading publication in the Information Technology solutions sector, offers one of the best comprehensive platforms for technology experts, IT customers, and tech heads to share their knowledge and insights about the latest tech trends. The magazine also lists the top leaders in the emerging technologies, products and innovations in the tech industry. It is an honor for Bridge Global to be a part of the annual list amongst companies like – Cognizant, Avnet, Avanade, and Booz Allen Hamilton that delivers best IT services and impact marketplace. Bridge Global, a robust IT services and solutions firm founded in 2005 by Hugo Messer, has a clear vision to offer outstanding global IT collaboration, consulting, and offshore solutions. What is unique about Bridge Global’s working model? Technologies that we leverage the most are – .NET + cloud solutions, Hybrid solutions for mobile, web and eCommerce solutions. Bridge Global practices SCRUM and follows Agile methodology and have a good number of certified SCRUM masters and product owners. The company uses a unique method to find the right IT talent for clients, and ensures a hassle-free and efficient remote working by teaming up appropriate IT solutions. Continuous staff training and providing client training on how to collaborate successfully in a distributed team further leads to success. The last 4-5 years have seen optimistic growth patterns in the company. The company is in the phase of expanding its global operations further and is growing its presence in North America, Europe and Asia. Bridge Global is a global IT Solutions Provider that has its roots in the Netherlands and has grown from strength to strength to provide software solutions for businesses worldwide. Our customers are stable and ambitious software companies/departments who have trouble finding talented programmers to scale up their business. We find the right team for the right position and support customers to collaborate with their colleagues remotely. You can read more about what moves us on our blog (www.bridge-global.com/blog) and on our website (http://www.bridge-global.com/). You can see faces and stories on Facebook (https://www.facebook.com/Bridge.Global.IT.Solutions/) and videos on YouTube (https://www.youtube.com/channel/UCK8W_PNXf064f8oBa86uv6Q).